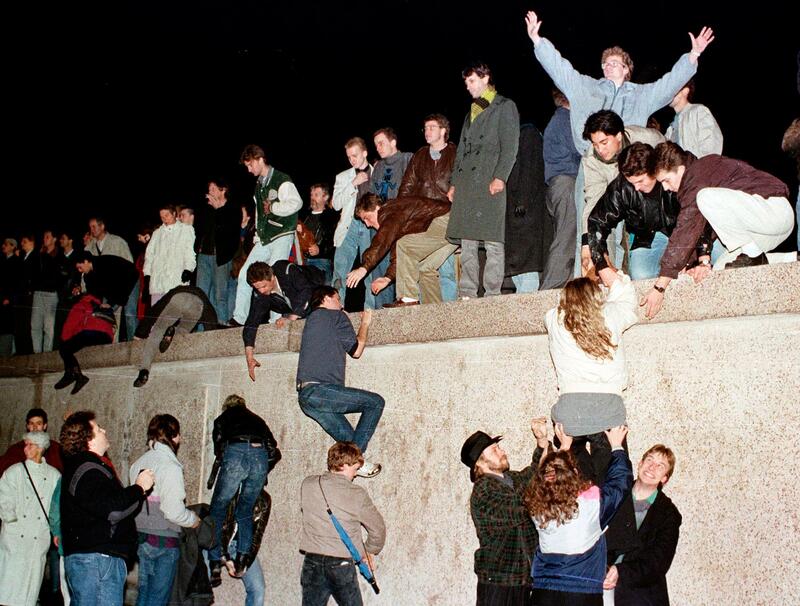 As I'm sure you already know, this week saw the 25th anniversary of the fall of the Berlin Wall––or, as those pranksters in the old German Democratic Republic called it, the "Anti-Fascist Protection Rampart." 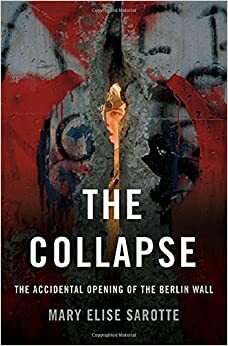 I'm reading a fascinating book about it, Mary Elise Sarotte's The Collapse: The Accidental Opening of the Berlin Wall. If it were not for the tragic destruction of lives caused by the Wall, the story of its permanent breach in 1989 would be comic. One Politburo guy says the wrong thing at a press conference, suggesting the Wall is open, and the next thing you know, hordes of people from both sides swarm the area around the Brandenburg Gate and checkpoints throughout the city. On that cold night in November, there was almost a party atmosphere to the gatherings, especially once the guards, who had not been told in advance about any new rules, started letting people through. Of course, there's a lot more to the story than one simple slip-up at a press conference. Sarotte zeroes in on a dozen people whose names you've likely never heard, and shows how their experiences illustrate the factors that came together to bring an end to the division between the two Berlins and, ultimately, the end of Communism in eastern Europe. If you want to read more about the Wall than its collapse, the definitive history is Frederick Taylor's The Berlin Wall: A World Divided, 1961-1989. This is a masterful work of historical research and writing. One of the things Taylor reminds us is that, horrific as the Wall was for so many people, it served the political ends of both East and West. East Germany was losing all of its most productive citizens to West Germany, and this worked to ratchet up the tensions that threatened to turn the Cold War hot. The Wall stabilized the political situation and, in effect, those on the wrong side of it paid the price for a degree of peace and safety in the rest of the world. About the only thing to regret about the end of the Cold War is that it nearly dried up the supply of Cold War espionage novels. To me, the very best spy stories are the Cold War stories, and you can't beat Berlin as the locale. The lodestone is, of course, John le Carré's The Spy Who Came in from the Cold, made into a movie featuring Richard Burton as the depressive MI-6 operative Alec Leamas. Le Carré is the king of moral ambiguity, and there's plenty of that in this novel about double agents. The climax takes place at the Wall, shortly after its erection. Len Deighton's Bernard Samson series consists of three trilogies and a prequel. The first book, Berlin Game, has jaundiced MI-6 officer Samson traveling to Berlin to deal with the crisis of their valuable agent, Brahms Four, wanting to defect. Complicating things, Samson is also aware that there is a mole among his colleagues, and the presence of that mole may jeopardize Samson's mission––and much more. Berlin Game, and the other two volumes in its trilogy, were adapted to a 12-part miniseries called Game, Set and Match. Though this was televised in the late 1980s, it looks like it's not available on DVD or streaming video. 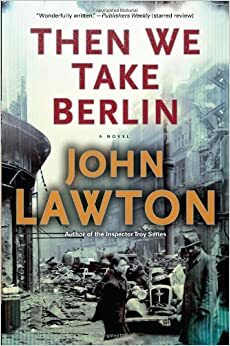 I've written about John Lawton's Then We Take Berlin here. It takes place mainly in Berlin, both immediately after World War II, when the city was divided up into zones controlled by the four allied powers and it was relatively easy for people to pass from zone to zone, and then in 1963, after the Wall has been built. Our protagonist, a Cockney known as Joe Wilderness, had a wild time when he was stationed in Berlin after the war. In his spare time from sniffing out Nazis for the army, Joe was a wheeler-dealer in the black market. In 1963, he's persuaded to return to Berlin to smuggle an old woman out of East Berlin. John Lawton is one of my very favorite novelists, with characterization being his strong suit. Then We Take Berlin not only introduces a new and striking protagonist, it also has a large supporting cast of vivid characters, some of whom you'll recognize from Lawton's Frederick Troy series. The Berlin setting is a big bonus. This one's not a spy novel, but I think it's a must-read for anybody interested in what life was like on the eastern side of the Wall. 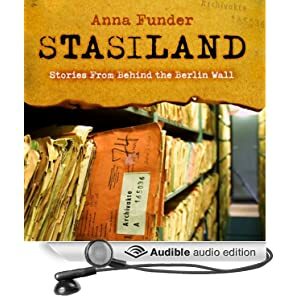 Anna Funder's Stasiland tells stories of various people who lived in East Germany. Some were resisters, but some were informants for the East German Ministry for State Security, aka the Stasi. The Stasi was by far the largest surveillance agency in history. Some estimate that there was a full-time secret police officer for every 180 people in East Germany. Almost worse than the official Stasi officers was the fact that so many civilians routinely informed on their co-workers, neighbors, friends, family and even loved ones. Since the reunification of Germany, Stasi files have been made available, and many people have requested to read their files, with traumatic results. Of course, there are many, many other books about the Berlin Wall and East Germany, both fiction and non-fiction, but this short list of some of my favorite books will give you a start if you're interested in diving in.